With winter approaching it’s a good time to look back and reflect on the year that has passed and, as the award season is starting, I thought I’d introduce the inaugural Wellywoman awards. Courtesy of Wellyman and his rediscovered model making skills I have the ‘Golden Wellies’ which I’ll award for those garden related greats of 2012 and, in homage to the Golden Raspberries that go to the year’s worst films, I bring you the ‘Golden Snail’ awards. It was going to be the ‘Golden Slugs’ but modelling a slug and making it actually distinguishable from, well, a blob of modelling clay proved a little difficult. 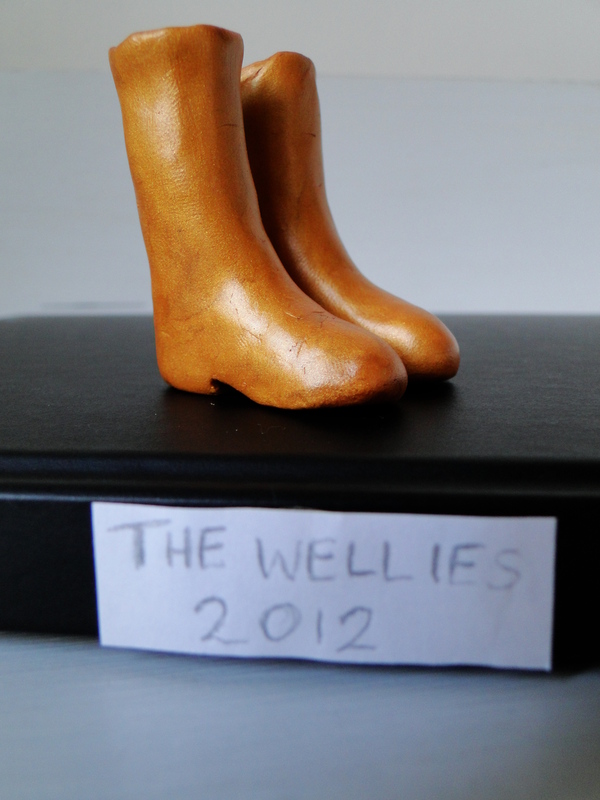 So it gives me great pleasure to announce, in no particular order, the recipients of the first ‘Golden Wellies’. 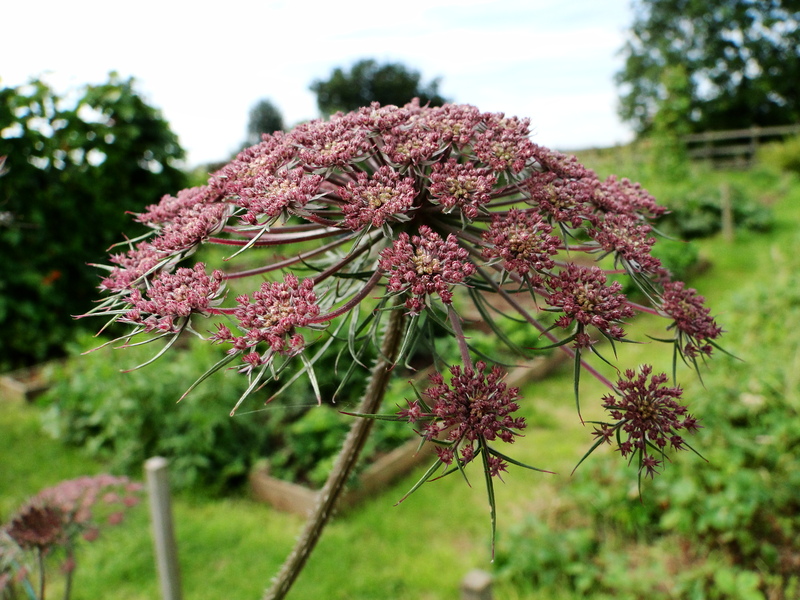 My flower of the year has to be Daucus carota ‘Black Knight’. In itself, it’s not the showiest of blooms and the tricky growing conditions this year meant it took a while to get going but once it did flower it just kept on going right into November. The plummy-pink coloured umbel flowers of this variety of carrot looked so good in arrangements and they lasted up to 2 weeks when cut. This was the first proper year for my tayberry fruiting. Although I made the mistake of buying the thorn covered variety which has made it interesting and painful when training into some semblance of a structure, its fruits have more than made up for any scratches. A combined flavour of blackberry and raspberry and a long fruiting season have made this a great addition to the plot. The humble pea gets my nod for an award. This is the first year I have grown them. I’ve always wondered what was the point when frozen peas are so good but nothing on the veg patch this year could beat the sweetness of freshly picked peas eaten raw. They are top on my list of crops to grow in 2013. My favourite TV gardening programme of the year had to be Sarah Raven’s Bees, Butterflies and Blooms. The series followed Sarah as she tried to change perceptions about community planting schemes for the benefit of locals and wildlife. It was fascinating, informative and, at times, infuriating (it appears some would rather having plain old, boring grass than a beautiful flower studded meadow). This was the year I discovered the delights of squashes. The plural there is really rather stretching it. I grew Uchiki kuri and the weather conspired to make this not the best of years to be trying to grow squash for the first time. I didn’t, at one point, think I was going to get anything at all from the plants so I was delighted when I spotted two yellow fruit forming. It was a bit of a race against the lower temperatures and lack of sunshine to see whether they would actually ripen in time. In the end, one grew to a really significant size and turned a beautiful deep orange colour, the other ripened but didn’t grow very much. It was a squash version of Little and Large. Despite the low yield I’ve been bitten by the squash bug, so I’m hoping I can fit some more varieties into my planting plan for next year. The tool of the year has to go to my Burgon and Ball flower snips. I was lucky enough to receive a pair this time last year to review on my blog but November wasn’t the best time of year to put them through their paces. I didn’t think anything could replace my Felco secateurs but I used my snips all year-long. 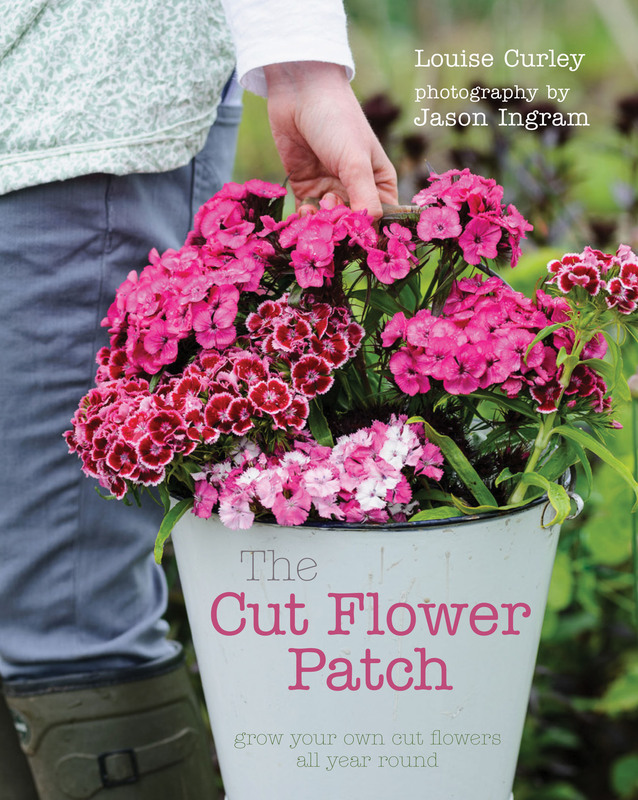 They can cut through surprisingly thick stems and are lighter and smaller than my secateurs so I tended to favour them. The one problem is their green coloured handles. I’m not sure how much time I wasted this year hunting for them after I’d put them down somewhere. I think some coloured tape around the handles may be applied this winter. Despite the weather I did get the chance to visit some beautiful gardens. After years of wanting to go to some of the iconic gardens of East Sussex and Kent we finally got around to visiting them. My favourite was Derek Jarman’s garden at Dungeness. The simplest and possibly least typical garden it had immense charm and was set in a stunningly bleak location. The plants that thrived here seemed all the more precious because they were growing in such a hostile environment. 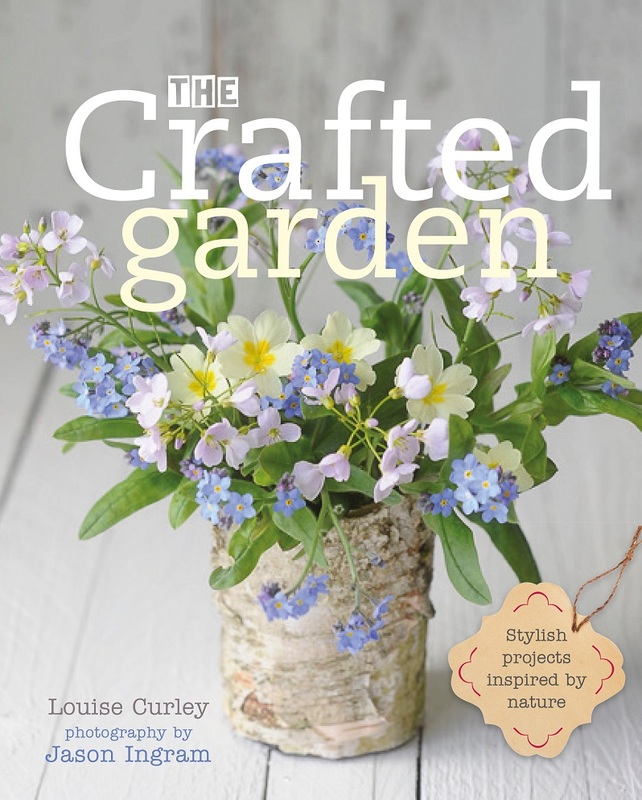 For me it showed that the need to grow is an innate response to our environment and that even when faced with such unlikely growing conditions the desire to create beauty using plants was too strong to resist. The amazing food at Lia and Juliet’s Supper Club deserves one of my ‘Golden Wellies’. I was new to the concept of supper clubs when we went along in June but what really drew me to this one was the celebration of fruit and vegetables and seasonality. Keen allotmenteers, Lia and Juliet wanted to showcase the produce they grew and make it a real event. With tea-lights lining the path to the front door, fairy lighting in the back garden and a verandah for pre-dinner drinks the scene was set for a great night. Not only was the food great but so was the company. In fact we loved it so much we went back again in October. Some golden wellies have to go to the newly installed greenhouse. It was a pain to build and was responsible for a fair degree of swearing and although it’s not really the time of year to start using it to its full potential, I love it. There are already several seed trays of hardy annuals in there, some salad leaves and herbs. Roll on spring. And finally, my last ‘Golden Wellies’ of 2012 go to my fellow garden bloggers and tweeters. They are too many of you to mention individually but you’re great. You inform, inspire and amuse. I’m looking forward to reading about the highs and lows of 2013. Read my next post to see who and what will receive a ‘Golden Snail’. A lovely round up of the year. When you see it like that, you realise that it hasn’t all been bad, in fact, most of it’s been quite good actually. I’m pleased to hear that your tayberry has been given a Golden Welly as I’ve bought one this year, though I’ve now realised that I’ve made the same mistake as you have, mine’s a thorn covered variety too. I didn’t even think about training it when I bought it, so I’d love to hear how you’ve done it. I’ll take a few photos and do a post on it, Jo. The fruit are gorgeous so you’re in for a treat. Dungeness, yes! I did enjoy visiting with you. Thanks Diana, Glad you liked it. looking forwards to seeing WM’s rendition of a snail. I have a feeling that like the wellies, it’ll be … golden. What an enjoyable post, and I wholeheartedly agree with your choices of TV series and garden. 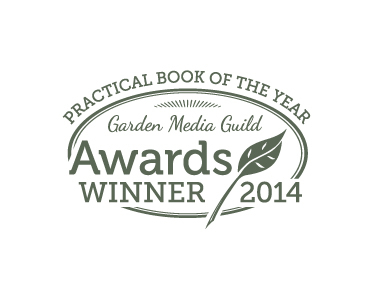 As one of those fellow garden bloggers and tweeters the Golden Wellies award is much appreciated, as are your comments about us. Why thank you WW – I’m blushing 🙂 Now that the ‘Black Knight’ has recieved a Golden Wellie I’m even more convinced that I must give it another go next year. Looking forward to the unveiling of the ‘Golden Snail’ awards. You’re welcome. 😉 I think you’ve guessed I like Black knight and I can highly recommend it. Very good my dear! 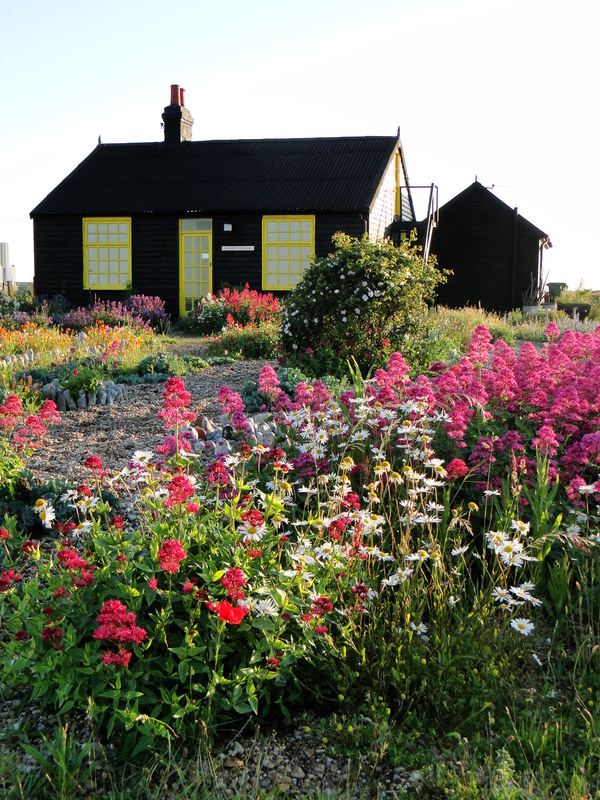 and I had not heard of Derek Jarman until I read and saw his legacy gardens until your blog……the best! 🙂 Glad I ventured over to you blog! Exceptional!! Derek’s garden looks fab. Thanks Anna, it was an amazing place. I* agree, your Black Knight is so stunning, it should be in everyone’s garden! Yes, I too really enjoyed Sarah Raven’s programmes, they made a nice change from the usual. Its great to review the year. It hasn’t been a complete disaster, some plants have thrived in the damp weather. I’m another one who has recently planted a thorned Tayberry but sounds like its worth coping with the spikes! The fruit are gorgeous but I good pair of gloves will help when you need to tend the plant. Really quite vicious.